This game was so typical Spurs – we dominated the first half, playing some of our best football of the season. We created good chances and got into good areas on a number of occasions. Modric was at his sublime best, starting and finishing moves, and Pavlyuchenko’s link play was first class; he found space easily with his clever movement and got the ball into his team mates, picking up two assists. Crouch took his two goals really well, getting on the end of excellent crosses from Pavlyuchenko and Huddlestone. However, for all of our good play, we nearly gave up two points with some sloppy defending. 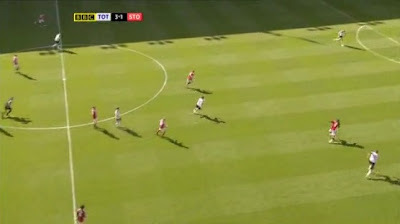 Firstly, Dawson committed himself on half way, and Huddlestone didn’t make a challenge on Etherington, allowing him to get well into the box to finish across Gomes. And then Bale dallied on the ball, allowing Jones in to score a wonderful second. If Walters had finished from three yards out in the second half, we could have been left frustrated yet again. After a van der Vaart pass towards the edge of the area is cleared, the ball bounces and Corluka competes with Jon Walters, who won a lot of headers all afternoon. Walters wins the ball and nods on to Etherington, who is in his own half when he receives it. He has Dawson ahead of him, who is essentially the last man. The way Dawson is beaten is not a pretty sight – he doesn’t even make Etherington do anything cleve. Etherington literally just shifts the ball beyond him and uses the fact that he has the momentum. Huddlestone does a great job of keeping up with him, but misses his chance to muscle him off the ball, take him down for a free-kick, or slide in to try to get a toe on the ball. Huddlestone panics a little and finally commits himself just outside the box. Etherington is strong, and stays on his feet, just angling the ball around Huddlestone. 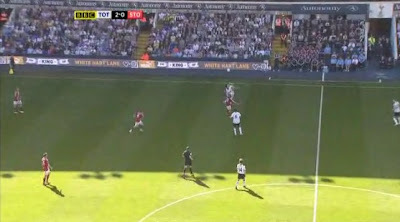 Bearing down on goal, he has limited options – Kaboul has taken up a decent position, so the pass to Jones is not really on. Gomes seems to have his angles right. 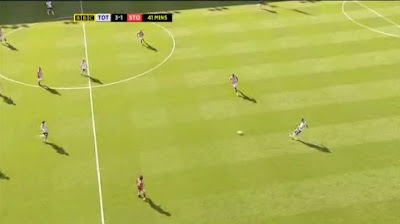 Yet Etherington manages to pick out the far post – Gomes doesn’t read it, and just sort of falls over backwards. I think he should be doing better here. A fine goal from Etherington, who is having a very good season. Spurs have comfortable possession, and Kaboul slides the ball into Bale, who has Modric available to lay off to (or he could go straight back to Kaboul). 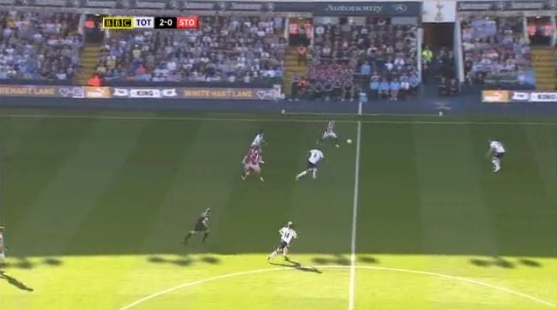 He dallies on the ball, which narrows his options, and Stoke players close around him. Walters pounces, and nicks the ball away towards Jones. Jones takes it into his stride. He times it just right – getting his shot away just as Kaboul closes. And it really is a fantastic finish – out of the reach of Gomes and into the top corner. Nice to see Dawson finally appearing in the box as Etherington scores. I realize his feckless lunge left him tailing Lasty on the stretch, but when you fail miserably, a trot back, maybe a cuppa on the way, does not endear you to the fans. Shocking. no wonder he posted anonymously !! Huddlestone should've done better for the first goal, gave Etherington a free. And Kaboul should've done better for their second (of course not as much to blame as Bale, though), when our midfielders have the ball under pressure, our CBs should of course stay back to protect, not stay as far up on the field as they are. Jones is left alone. I think that defending has to be cleverer than this. 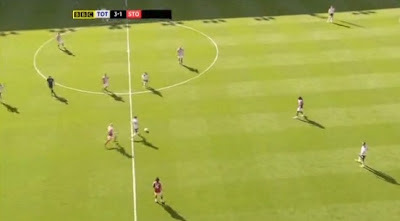 For example, Dawson should never have allowed Etherington to go on his outside, because pushing him towards the midfield means that he then comes up against another Spurs player. Many of our defenders tend to stand around ball-watching rather than be on the move with players. It was nice to hear some compliments for Pav from HR. I would like to keep Pav, let go of Defoe and bring in Odemwinge for two reasons: 1. he appears to be a very good striker with a lot of potential; 2. being Russian by birth he could communicate with Pav. 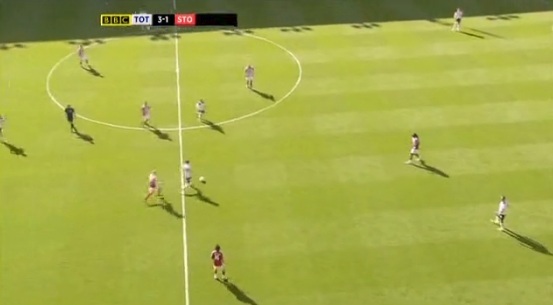 Pav's allround contribution is better than the rather one-dimensional Defoe. Hudd played well, but would you put him in instead of Sandro on Wednesday? Sandro offers protection, but Hudd would improve possession and thereby ease pressure on the team. As a Stoke fan got to say I really enjoyed this match even though we lost. You guys deserved it I think on your first half performance, but I was encouraged by our refusal to lie down. Thought we had you on the ropes for the last 20 mins. Good luck for that CL spot. Nice to have a comment from an opposition fan - thanks for that. I was impressed with Stoke's attitude too. Walters had a decent game and looks a good player (certainly a handful). In the first half we played some of our best football of the season, so I would have felt very hard done by had we lost but, even so, Stoke made a cracking game of it in the second half. Sweetsman - I would play Huddlestone on Wednesday if he can manage a second game in a week. What have we got to lose? The reason I would go with Kaboul over Gallas is that he's better on the ball and more of a threat from set pieces. Two defensive errors but lots of positives from this. Pavlyuchenko's best game for Spurs; Crouch redeems himself; Modric on top form; return of Tom and Kaboul. And what a week ahead: Real and Arsenal both at home. And Liverpool just beat Man.City. I wouldn't bother analysing tonight's goal as it is pretty obvious. However, I think that one must not make a scapegoat of Gomes: yes, it was a poor attempt, but his saves in crucial matches have to be acknowledged. Tonight's match showed that Huddlestone is probably not quite up to his usual standard and his wayward passing will put us under pressure against Arsenal. I think that Sandro should start as he will provide better cover for the defence. One thing that is worrying is that our players don't come close to others to provide an outlet, causing long, speculative passes. The pass out to Bale is becoming a tad cliched.